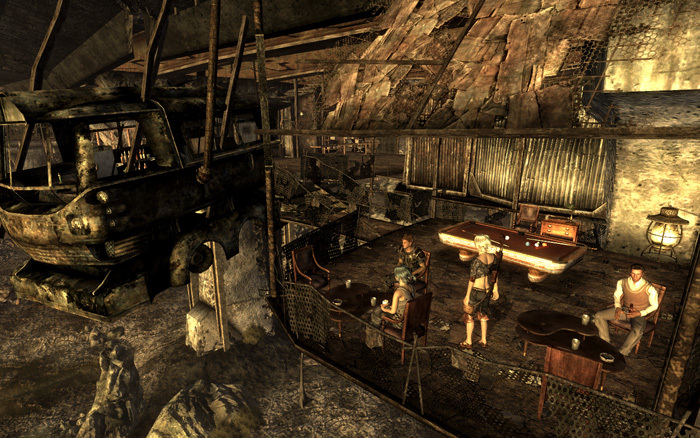 The Crimson Caravan is a quest mod for the game Fallout 3, and is a continuation of Arefu Expanded. 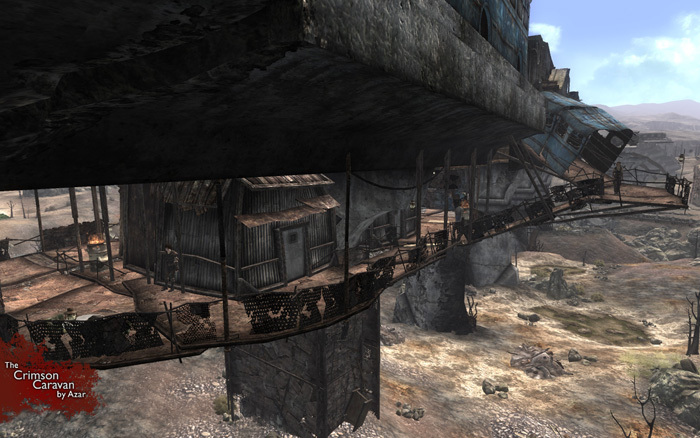 It was created with the GECK editor and uses Fallout 3's existing graphical assets as well as some custom assets, and took three months to make. I was responsible for level design, level layout, level scripting (AI, puzzles, etc. ), game flow, story writing, play testing, and user support. 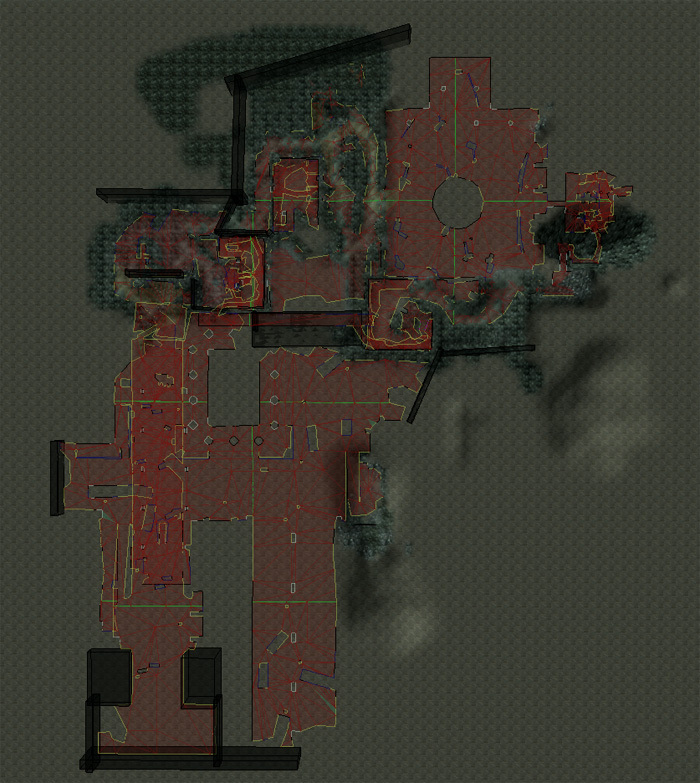 The goal of this mod was to go beyond Arefu, and explore other parts of the Wasteland. The main quest line involves the player helping out the Crimson Caravan, a new caravan that has moved into Arefu. They need help finding their old crewmembers and convincing them to rejoin. 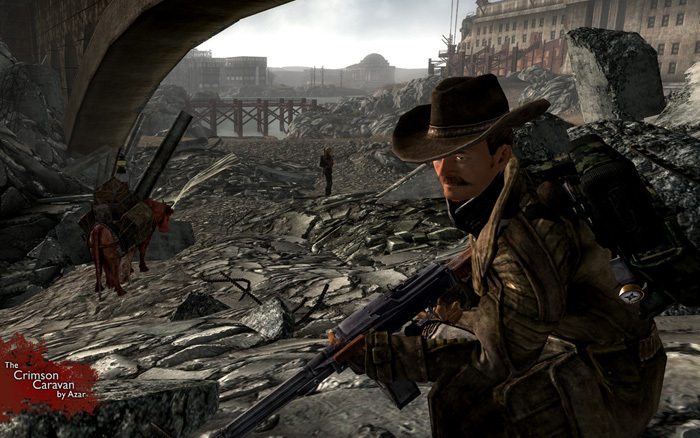 The player must make his way across the wasteland to find them. Click here for a walkthrough document of The Crimson Caravan. The Chase - This is a quest in which the player must find Robert Foster, a missing crewmember of the Crimson Caravan. In this video, the player has found Robert in the town of Minefield, and must pursue him. For better playback quality, switch the settings from 360p to 480p. Battle in the Junction - In this video, the player helps a group of Regulators defend their headquarters from an enemy attack. The setting is a new location that I built called the Junction. For better playback quality, switch the settings from 360p to 480p. Hyde in the Dark - In this video, the player goes to Hyde Park Subway Station to find one of the Crimson Caravan's missing crewmembers. For better playback quality, switch the settings from 360p to 480p. 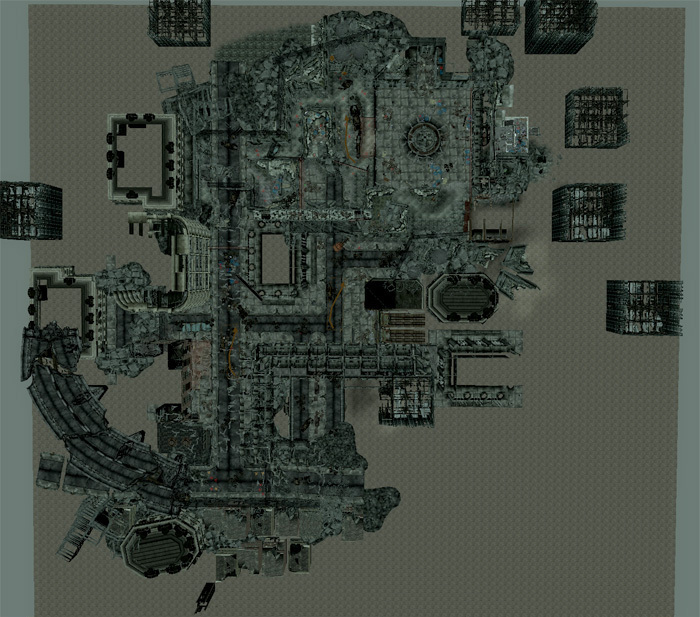 This shot shows the Undersection, one of the new areas that I built. All the NPCs are following their own daily schedules. The store owner, for example, opens his store front at 7 am, and closes at 7 pm. When the store closes, the lights turn off and the table items disappear. This is the Undersection, an extension that I made which adds houses and shops underneath Arefu. Calavera Cafe, one of the restaurants in the Undersection. After the player finishes the main quest, the player earns a caravan crew and can go out to do missions. 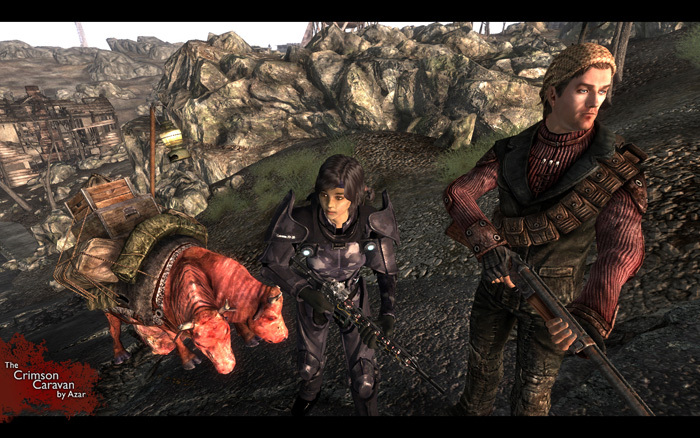 The crew members and Brahmin (pack cow) are fully customizable. I also added extra gameplay scripting for them (i.e. take cover if their health falls below 20%, run to the player if the distance between them and the player reaches a certain distance). This is Bonzo, one of the Crimson Caravan crewmembers you must find. He is fully cusomizable, and the player can tell him what weapons to use, what armot to wear, and what tactics to use (follow me, stay here, etc.). This is the Junction, a new location built for one of the new quests. 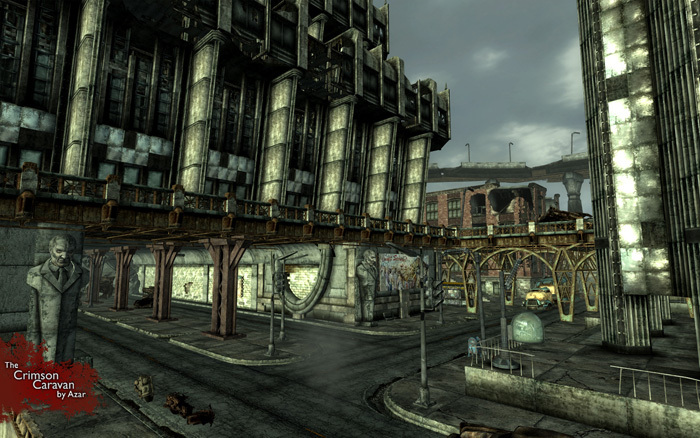 The Junction is an abandoned city district that is now home to a rogue group of Regulators (lawkeepers of the Wasteland). 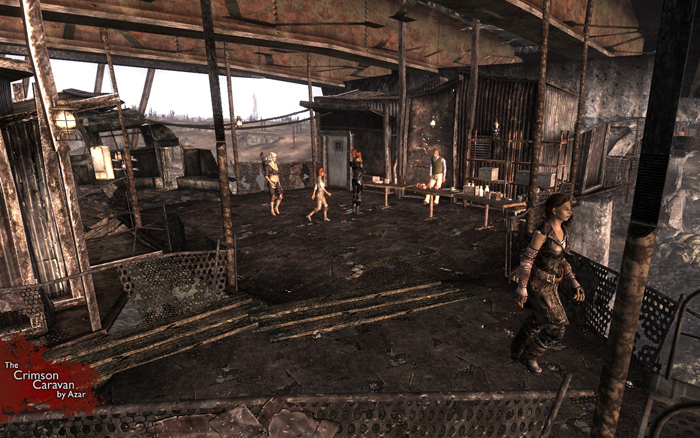 The player must come here to rescue one of the Crimson Caravan's crewmembers from the Regulators. The player can take one of two approaches. The "peaceful" path consists of two parts; the first involves exploring the Junction to find out clues about it's history. The second involves defending the Junction against supermutants. The "war" path has the player fighting the Regulators. The successful resolution of both paths is the rescue of the Crimson Caravan crewmember. This is the main square of the Junction. As the quest progresses, you must protect the square from a Supermutant attack to get in the good graces of the Regulators. This is Regulator Wallace, the leader of the Regulators you meet in the Junction. You must find some way to convince him to release one of the Crimson Caravan's crewmembers. A top-down view of the Junction in the GECK editor. A new worldspace was created for the Junction. The layout is that of an abandoned city district, with a factory, a general store, a cafe, and a university. A top-down view of the Junction in the GECK editor. 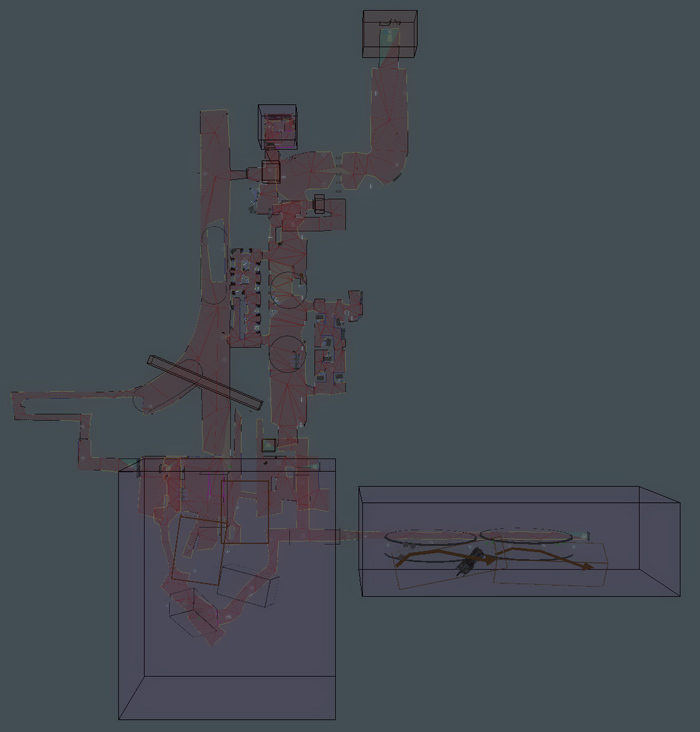 This shows the navmesh that was created for AI pathing, as well as collision boxes to prevent the player from traveling out of the map. The cover provided by various structures (walls, barricades, etc.) was also optimized to get better combat performance out of the AI. 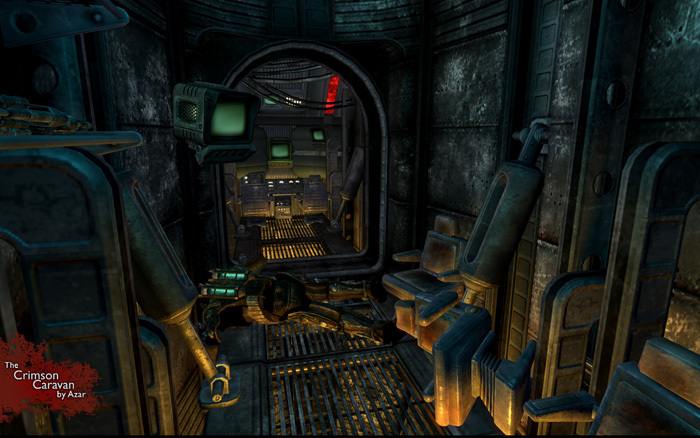 This is the interior of a crashed enemy helicopter. One of the quests involves the player finding this helicopter and retrieving the military hardware locked inside. There are different ways of doing this, depending on the player's approach. 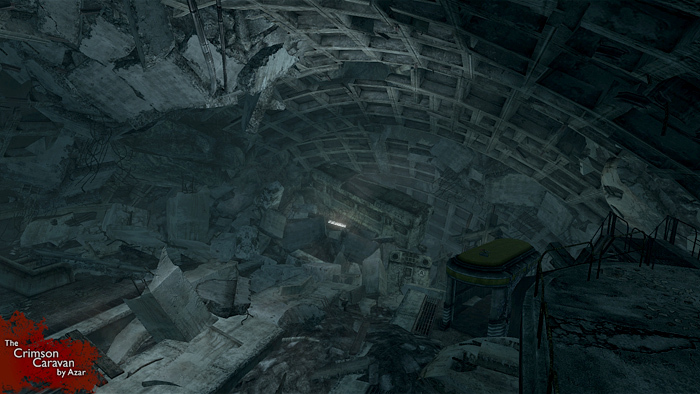 This is Hyde Park Subway station, a new location created for one of the quests. 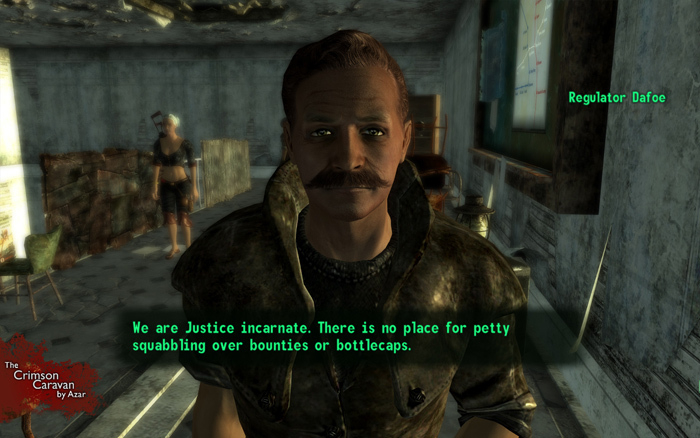 The player must come here to find one of the Crimson Caravans' missing members. The quest features a mix of puzzle solving and survival-horror style combat against ghouls. 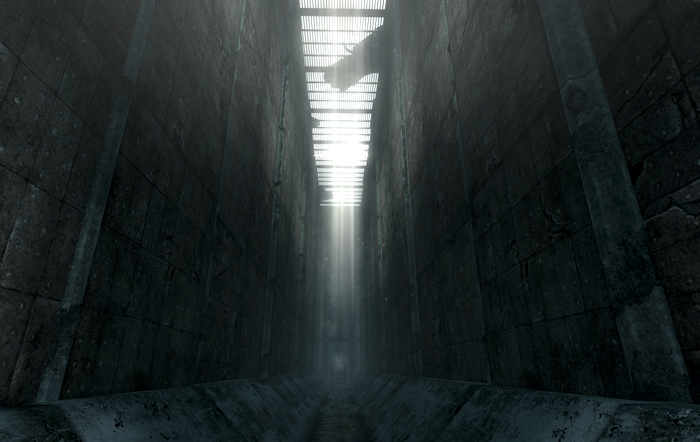 The player's journey through Hyde Park Subway Station will eventually lead him to the entrance of the Sunken Overpass. A top-down view of Hyde Park Subway Station in the GECK editor. The layout is like that of a real subway station, with a lounge area that has offices and a restaurant, and an escalator leading down to the platform. 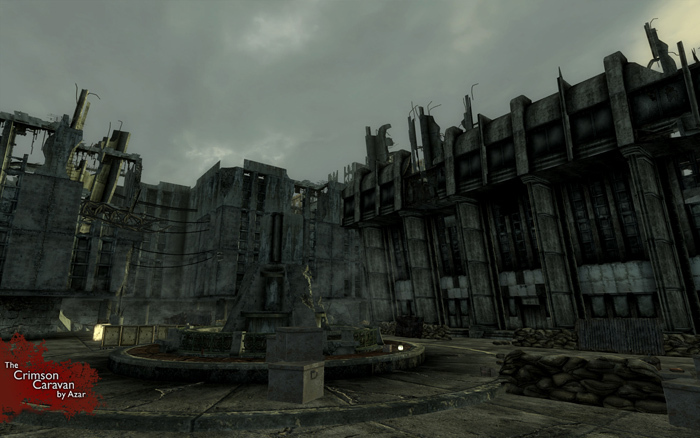 New areas of the map are unlocked as the player progresses further into the quest. 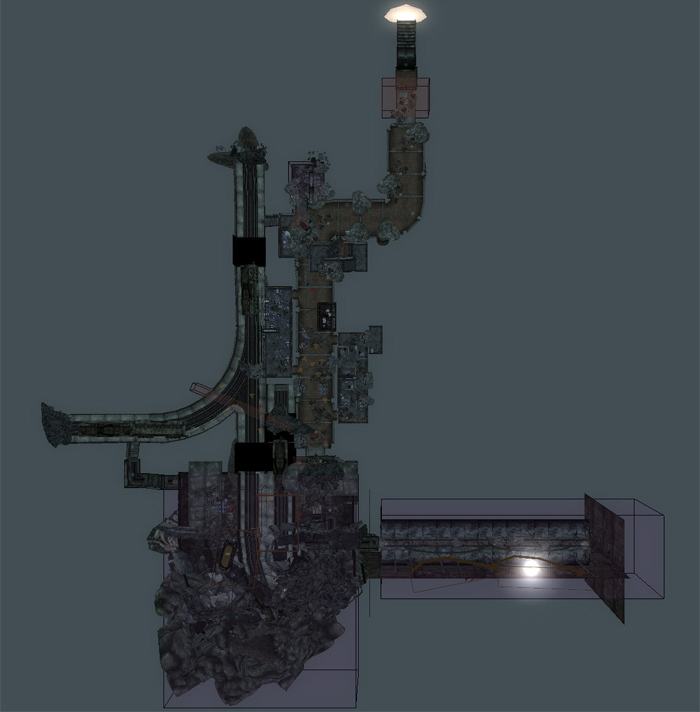 A top-down view of Hyde Park Subway Station in the GECK editor. This shows the navmesh that was created for AI pathing.